Proximity fobs are discreet little devices that hang on your keychain and trigger your car’s smart keyless entry to unlock and your keyless ignition to start. If your car’s push-to-start ignition fob is broken or needs new batteries we can help. Call Danny’s Lock & Key and one of our full-service mobile locksmith vans will come to you and repair, reprogram, or replace your keyless ignition fob and get you back on the road. From proximity fobs to traditional ignitions, Danny’s Lock & Key, can help you with your all automotive locksmith needs. We have lots of experience fixing key fobs. Our full-service mobile locksmith can make you new keys, replace lost or broken ones, reprogram a proximity fob to work with your car, and even set you up with a couple of spare keys in case you need them. We can make keys for most vehicle makes and models, and it usually doesn’t take more than a few minutes to get your proximity fob programmed to work with your vehicle. 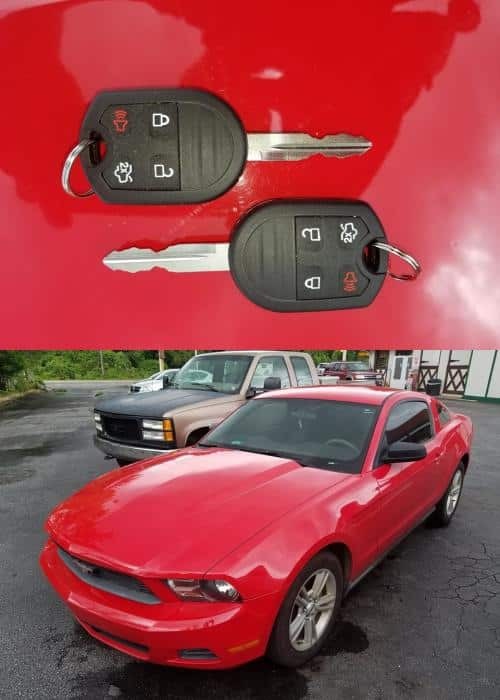 Our locksmith cut and programmed new remote head Keys for this 2010 Ford Mustang in Helen, Georgia. Here at Danny’s Lock & Key, we take pride in being an honest, professional, full-service mobile locksmith. We’re fully licensed and insured, so you can trust that we can handle any job with professionalism and quality. We are active members of both 1-800-Unlocks, the Fair Trade Locksmith Directory, and NASTF. Danny’s Lock & Key provides fast mobile auto locksmith service to Habersham County, White County, Banks County, Hall County, Stephens County and anywhere else in Northeast, Georgia. We are available 24 hours a day, 7 days a week.